David Hefner is known for his swirling, psychedelic repetitions, and his meticulous explorations of wood grain. He sat down with me to answer a few questions about his method and his mission. Kevin Ivester: Where do you find your plywood? David Hefner: Buying new wood is no fun. I’m always on the lookout for weathered plywood, the older the better. When I come upon wood, I look at it, decide. I’m always working against the sentence, “Please don’t bring that home.” Balanced against, “ I regret I didn’t bring that home.” Thus, I bring it all home, lean it against the studio and shop and over time – decide. KI: Can you describe your method? DH: The work begins with a lot of just staring at the wood, and trying to see it in transformation. The corner painting, I stared at those boards together over several years, really just trying to talk myself out of committing to such an odd, impractical, thing to do. But occasionally the composition would rise from the wood grain and reach across the corner space between the walls and I had to try for it. Color is the game in trying to make things move. KI: How much does the existing wood grain predict the final painting? DH: It’s the start. The original wood grain pattern is the impetus, it get developed, altered, but even with inevitable changes, I want the painting’s composition to feel that it is organic. I’m seeking subconscious imagery, but I want that imagery to be the viewer’s own, I intentionally try not to impose – I mean to just suggest. KI: When you see a discarded piece of plywood or surface on the side of the road, what are some attributes that might inspire you to take it home? DH: “Does it grab me?” “Does it make a sentence?” One of the paintings in our exhibition is titled, “Hedging on the Title”. When I saw the board, an oddly cut piece of construction scrap, in a wood pile in northern New Mexico, I asked, “Do twins share a placenta or are there Double Placentas?” I have no idea why my mind thought of that – it is not a question I had ever consciously asked before and, of course, it has nothing to do with that board. That’s my example: that is what I want for the viewer, that something of their own comes to mind and the thought interests them. When I see old wood, the goal is to leave it where it is, but I look at it and if it connects and compels then I bring it with me. This is part of the joy of having a little truck and a back yard. What I am trying to avoid is regret. I am trying to avoid waking up in the night and having to go back and try and find some piece of wood that has taken hold in my subconscious and is starting to haunt me. KI: Currently on display you have six paintings titled “Parables”, where did that title come from? DH: I’ve had each of the Parable boards with me for over five years and I have painted on them in stages. I wanted the paintings to feel epic with an allure of big narratives, and I linked on to them as “Of the (Heisenberg) Parables on the Myths of Origin.” The Heisenberg part is too many words! Not that I know what I am talking about, but the main point I take from Hiesenberg is that existence depends upon our perception of reality; these paintings are parables on the myths of origin only if you see them as such, otherwise they’re just odd paintings. I do think a lot of art comes from an off base humor, not really funny, just odd. Part of grouping them together as Parables 1-6 is so that I am not overly defining them for the viewer (titling them individually is too a specific), but I want to acknowledge a connection between the boards. That connection is obvious to me in the shared tones of their coloration. They are of a palette, that to my eye, is reminiscent of a number of the colors in some of Joseph Hammer’s pieces, especially the aged book cover collages that are hanging with them. I like our work together. KI: What was your inspiration behind your corner piece? DH: The answer is Valdimir Tatlin, Moscow,1915! The name of the show was “The Last Futurist Exhibition of Pictures.” He had a wall sculpture in a corner that physically reaches across the corner space, and I wanted to make a two dimensional version that visually reaches across the corner. 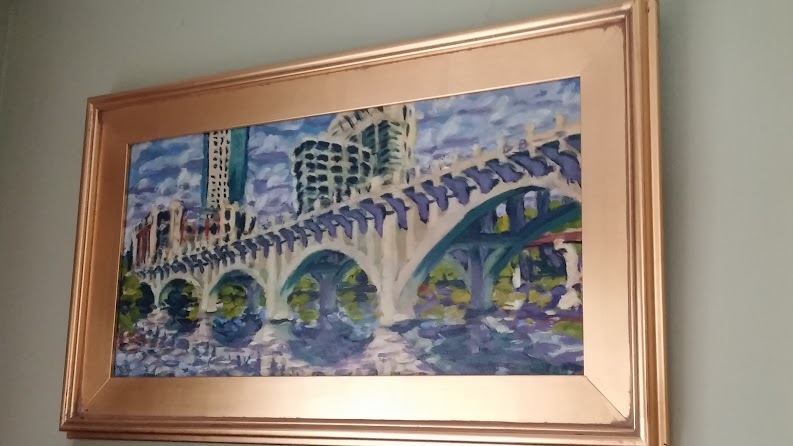 Even if it only happens subliminally for an instant that would be the success of this painting and elevate it to a “device” as it would perform a function. The function would be in creating a thought projection for the viewer. (The end punctuation is suppose to allow the sentence to be either a question or exclamation.) 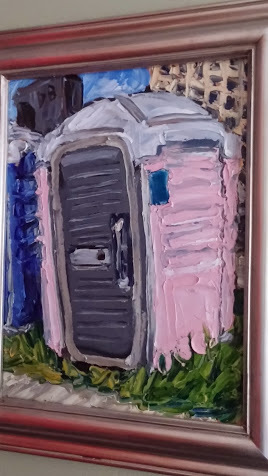 I want the viewer to stand in front of it so that the piece reaches to the edges of their peripheral vision and hopefully they will have a moment where the paint images across the open space and in that moment they remember what they dreamed the night before. I am nothing if not ambitious! Too much info. and here’s more. Kazimir Malevich also wanted a corner in that exhibition for the first showing of his “Black Square” paintings. They are Russians and western anthologies tend not to feature them prominently. Anyway, Tatlin and Malavich have a “physical altercation” over who would get the corner in the exhibition space. History does not record who won the fight, but photos, documentation, show that they both got corners. History is Art History. That was the first punch of the Russian Revolution. If a third corner was available, I think my corner painting/device would have been well received in the 1915 Moscow exhibit; I might just be a 100 years late with it. KI: I’ve heard you talk about time in relation to your work, how important is this concept to you and for the viewer to think about when looking at your work? DH: I like to read Theoretical Physics; it’s beyond me, but I love any hint into the absolute friggin’ mystery of how time works. That we spend all this time with our bodies sleeping and our minds wondering around inside our heads, exploring impulses, predilections, linking memories. I think most people, me for sure, so often live in projections of the future, and reconstructions of the past. What I really want in the work is to stop time for the viewer, where they take a moment and connect to something of their own subconscious and enjoy exploring, perhaps finding a feeling, a sense of something recovered, a sensation like déjà vu. I want to thank David for sitting down with me for this interview. To see more of David’s work, visit our website: http://www.davisgalleryaustin.com or visit David’s website at: www.handhefner.com. David’s work is on display in our current show HAMMER/HEFNER at Davis Gallery until September 17th. Be sure to catch it before it’s gone! Joseph Hammer, known for his colorful cut-book collage work was kind enough to take the time to answer some frequently asked questions about the medium and process that makes his work so unique. You use book pages and printed ephemera in your work, especially in the background of your mixed media collages. Is there a pattern to what you use? Do you pick pages/words that have special meaning? In a large sense, by being usually in the background, the printed matter represents the inside of a book. I can’t say there is always a pattern to what I choose, but there are always words and phrases that appeal to me personally–and often reiterate my fascination with history, time, books, and words themselves. Sometimes I insert surprising or odd turns of phrase. In “Hidden Meaning,” I actually baited and tempted the viewer to find a secret interpretation. I won’t tell what it was. But, like all art, the “meaning” is ultimately in the eye of the beholder. That is what completes a work of art, don’t you think? Audience participation! Sometimes the words are upside down. Yes. And on purpose. In such instances, the words are treated purely as design elements: what is important are not the words, but the shapes of the letters. And your use of handwriting samples? That is like a human handprint added to the piece. A nod to people in the past who held these books and read them for whatever reason. I sometimes use it elegiacally, mourning the declining use of handwriting, especially cursive. What about your use of other languages or alphabets? I like to remind myself and the viewer that there are other languages besides English, as well as other cultures on this planet besides our own. And other alphabets—they do fascinate me. The shapes are amazing if you really look at them. And there are often other elements in your backgrounds: numbers, graphs, flags, maps, etc. Yes. I keep files of “Interesting Things” that I find pleasing and maybe useful someday. I insert these items as design elements, because of their shape, color, and so on. I like optical illusions, too. Do these things inform the titles of your works? Sometimes. Coming up with titles can be frustrating, challenging at times. I might pick a word, phrase or visual or emotional impression from a work to use as its title. Or not. One collage, “Austin’s Books,” uses books once owned by a guy named Austin. An assemblage called “Round One” employs real croquet and billiard balls. So is there a special message we might find in each of your pieces? Small messages usually. I rarely do art that is sending an outright political or social message. But there are exceptions. In “Are We There Yet?” I am directly commenting on human rights, using specific words, images and colors. With most other collages I’ve done, you’ll have to determine what the “meaning” is. But my message in general is always that all things are indeed ephemeral, including my art itself, filled with decaying books and papers— & words written long ago. How can you stand to cut up good books? Where do you get the books you use? Everywhere! From friends, strangers, at thrift shops, yard and estate sales, at Half Price Books ($1 bargain section), at the Recycled Reads store (run by the Austin Public Library), the latter a good source for really old materials. I prefer old books ideally, those that have the patina, the handprints, so to speak, of human use. Stains and spills, marks and burns, water damage, you name it. What do you mean when you say your work is “organic”? Authentic, no-filler (no backing or background of cardboard or new materials), no alterations. I don’t add unrelated materials to the construction. I use things as I find them. I don’t add marks or my own “patina” to them. How long does it take to make one of your mixed media collages? That varies quite a bit. And it seems that even I have a hard time estimating how long a piece will take; it’s invariably much longer— or much faster— than I think it’ll be. Since I do most of my work at nights and on weekends, I tend to measure time by that. So sometimes I say something will take me “5 evenings” or “two weekends and two nights”. Most of my collages have many pieces. I am pretty fast with the original layout and conceptualization. The cutting takes time, but the pasting actually takes a lot longer. But to answer your question, you could say that one of my collages takes anywhere from three to ten days to produce. Sometimes you mount your work rather than frame it behind glass. Why? Because I like the collages “in your face” as much as possible. Or rather, at your fingertips. I want the viewer to be able to touch and feel the textures, and even the warmth or coolness of the materials (I find leather bindings cooler to the touch, for example.) That adds the tactile to the visual experience. Sometimes it’s more practical to have a piece framed with glass, but I do like to run my hand over those old books. Tell us about your current show. I am experimenting more with color, texture and shape in this show than in previous ones. And I’m playing with different objects & materials, such as the billiard and croquet balls, the tintypes, and paintbrushes in my newest 3-D assemblages. I’m still fascinated by the Wiener Werkstätte (Vienna Workshop) school of art and design from the early 20th century, and pay tribute to it in some works. One thing I want to everyone to know: I had more downright fun doing the pieces in this show than any previous group, and I hope it shows. 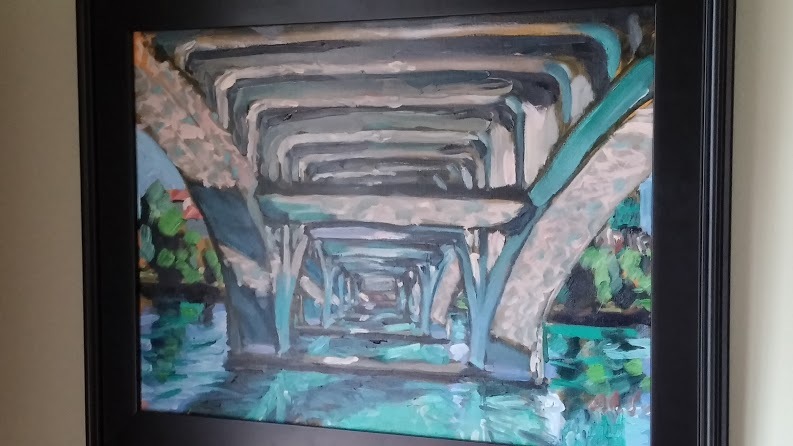 More of Joseph’s work can be viewed on our website http://www.davisgalleryaustin.com, Joseph’s Facebook page, https://www.facebook.com/joseph.hammer.79 and Joseph’s instagram page @joseph.hammer. Be sure to come by HAMMER/HEFNER which runs through September 17th at Davis Gallery. We’ve got Laurel Daniel’s solo show “Chasing Color, Finding Light” on display through June 4th and I can’t get enough of her work. This show features landscapes, still lifes and interiors steeped in warm tones that nearly feel like memories. Laurel’s work invites the viewer right into her world to feel the breeze and listen to the birds. We are all familiar with that feeling you get when you walk into your local farmer’s market. You can imagine the vibrant colors of the rows of peppers, the soft greens of lettuce. Perhaps the scent of fresh cut greens and herbs and the friendly faces bring you back to when you were younger and food was simpler, closer to home. For the past three years, Jan Heaton has studied these subtleties, while creating her collection of over 150 paintings focusing on the smells, the colors, and the sounds of farmers markets. Jan’s work adds another dimension to our beloved farmer’s markets. 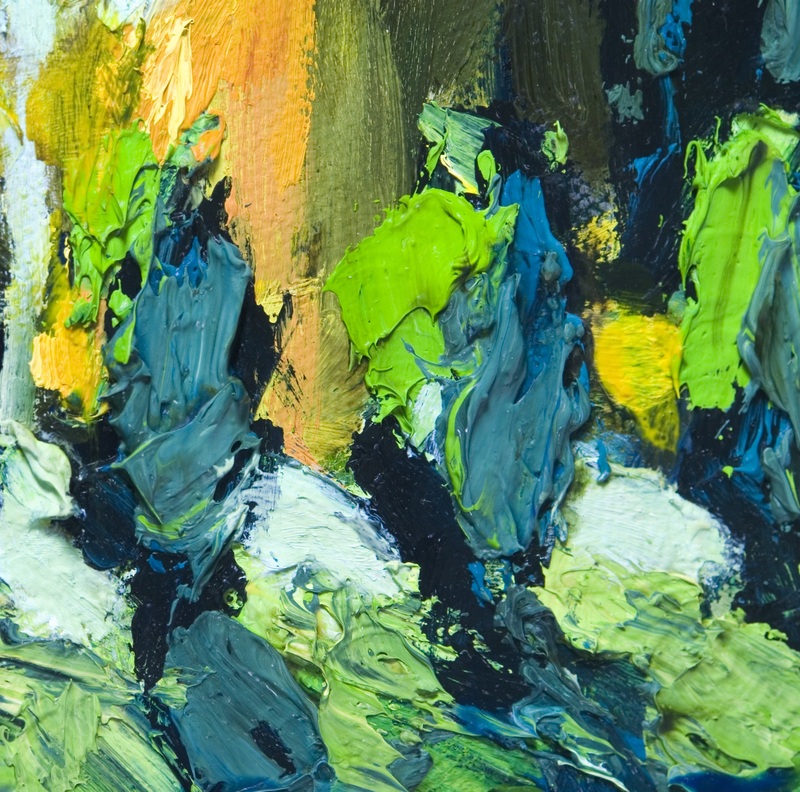 Through her work, viewers are hit with crisp, flowing lines and carefully chosen color. All of the vague sensations of the friendly markets and their fresh vegetables suddenly snap into focus when you see the intimate perspectives of Jan’s show The Market. Complete with sensitive repetition, a soft color palette, and arcing lines, Jan’s work frees the viewer to rediscover the comfort of food. Jan Heaton is an Austin based artist who has shown throughout Texas and beyond. She is known for her confident, clean strokes and striking color choice. Her work has the ability to bring clarity and a subtle energy to viewers. Jan was kind enough to take time to answer a few questions for us about her approach, her inspiration, and her experience creating. Kevin Ivester: How do you approach each day in the studio? Jan Heaton: I start my day with coffee, a hike in my neighborhood, or a trip to the gym, a physical start to a contemplative and quiet day. My studio is in my home so there are no distractions, which is just perfect for me. The view from my studio is all green, natural, very tranquil and frequently a family of deer will graze outside my window while I paint. Before I started painting full-time, I worked in advertising and graphic design for over twenty years. Schedules, deadlines, and challenges have helped me to produce my best work. I initially approach a new painting with a drawing in my sketchbook. The next step is deciding how to share the idea with meaningful marks. KI: I notice that many of your paintings explore small perspective repetition and pattern.Why is it that you choose these moments to share? When did you start painting these details? JH: In The Market series I was interested in exploring plant structures and abstracting the details. Isolating the configurations I observed in nature, and creating an intimate, unique and tranquil moment. The marks are calming as I paint them. KI: What types of thoughts and emotions do you pull out of your work when it is complete? Do they differ at all from your thoughts while you are painting? JH: Each painting is an expression of where I exist emotionally and spiritually at the time. I consider my paintings a visual journal. I am a storyteller with a brush instead of a pen. KI: I know you teach at the Contemporary Austin Art School at Laguna Gloria. How do you help your students through feeling like what they are making is not personal enough or unique? JH: I love teaching at Laguna Gloria. I attempt to empower my students to see the value of the work they are producing, whether they are a beginner, or an accomplished artist interested in a new medium. I personally think there are no mistakes and I don’t conduct class critiques. I guide them with a painting demo, step by step, but as they repeat the process, they arrive at a solution much different than mine. I learn as much from them as they learn from me. KI: As simply as possible, what is the best advice you could give to an aspiring artist? JH: I believe in sharing. Sharing my process, my tools, and my network. I believe in karma. I’m also a Malcolm Gladwell fan. I give my students a reading list and his book, The Tipping Point, is right at the top. The 10,000 hour rule. Practice makes perfect. For me it is all about work, repetition, and dedication. Having a supportive network of family and friends also helps. KI: Who was your best teacher while you were in school? What did they say to you that helped you understand your direction as an artist? JH: Both of my parents were professional artists. They are my major inspiration. They encouraged me always to do what I love. In school……there was Mr. Arthur Sipes, my middle school art teacher in Detroit. He encouarged me to attend a weekend semester session at the Detroit Institute of Arts. He told me I had a talent. I attended for three years, riding the city bus for an hour to get downtown. We sketched from the Diego Rivera mural in the great room, we drew from Rodin’s The Thinker at the art museum entrance, we learned how to create art inspired by the master works surrounding us. I then went to Cass Technical High School, a college prep high school that allowed me to major in the arts. 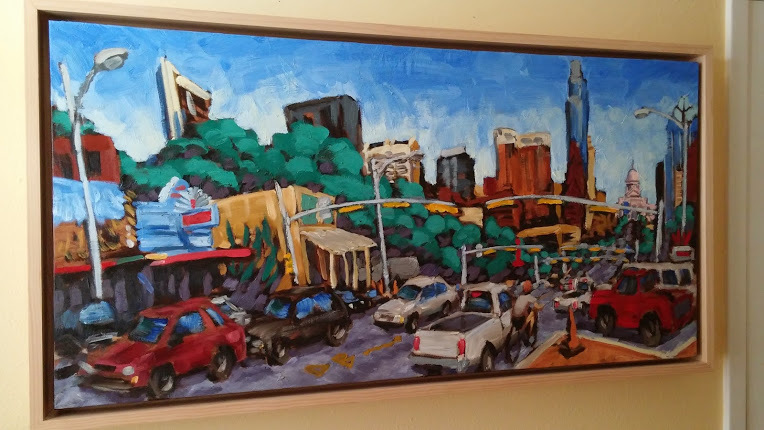 In my senior year of high school I exhibited my artwork with my mother in a downtown Detroit gallery, my first show! Thank you Mom, Dad, and Mr. Sipes! KI: And finally, In your mind, what is the most important thing about making art? JH: Being honest. Being true to yourself. I don’t expect everyone to relate to what I paint. The work is very narrative and personal. I am just doing my best to find the audience that does relate so that I can make a living doing what I love. I want to thank Jan for her time answering our questions. Jan can be reached at jan@janheaton.com for appointments at her studio, and her work can be viewed at http://www.janheaton.com or her Facebook page http://www.facebook.com/pages/Jan-Heaton-Studio/57266002163. Make sure to join us for her show The Market which opens tomorrow, March 5th from 7-9 pm. We’ll see you there! We took a visit to Daniel Burns’ studio to have a look at what was available. And wow he has some amazing pieces hiding there! Daniel is a street painter who has a unique ability to capture the quickly changing nature of a city. Over the course of his career he has painted in New York City, Los Angeles, and Austin. We couldn’t resist snapping a few photos of what we saw to share with you! There are so many fantastic Austin landmarks in View from South Congress! Being a street painter means that the artist paints on site. They paint quickly and spontaneously with an incredible amount of focus. Often there is lots of traffic, curious pedestrians, and city noise. It’s the urban version of plein air painting. Street painting also means picking somewhat unorthodox subject matter. To really capture a city, you have to go beyond the tourist sweet spots. Although there are plenty of those! 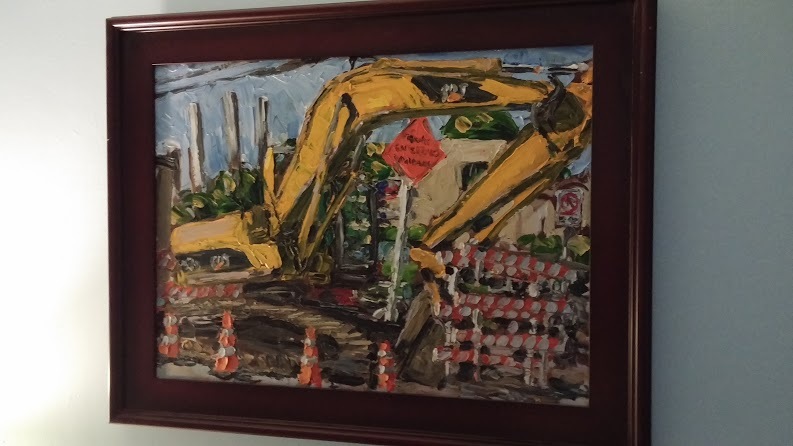 We love that he even captures the most familiar sight in Austin these days- the construction site! All of Daniel’s paintings have an incredible amount of texture to them. He applies the paint quickly and liberally which leave behind texture and movement to rival Van Gogh. Visit Daniel’s page on our website to see more images of his work. And as always, give us a call at Davis Gallery to see them in person! All pieces in this post are currently available.